As soon as the first of November rolls around, I am in full holiday mode. Despite the madness of the season, I like to spend as much time as possible with family and friends. Given the hustle and bustle of modern life, it’s often difficult to plan the downtime needed to relax and refresh our spirits. I think the holidays offer an excellent excuse to push the pause button on our crazy-busy lives and revel in the company of the people who are dear to us. While Thanksgiving is typically family time, this year I suggest celebrating a new tradition–Friendsgiving. This is a special time around Thanksgiving when you gather with friends (like you would with family) to spread a little holiday cheer, and of course, to consume large amounts of sweets and your favorite comfort foods. It’s a chance to let loose, escape the usual holiday chaos and just enjoy being with each other. I love entertaining, so I invited my friends over for a small Friendsgiving celebration. To keep things fun and causal, I set up my coffee table with an array of delicious treats and wine for an evening to catch up and hang out. I’m kicking off my party with these adorable cheese balls. I decided to shape and decorate them to look like apples. It’s a fun little twist on a cheese ball that will have your friends thinking you’re the hostess with the mostest. While there are many cheese ball recipes online, this is one of my favorites. In a large bowl, add the white cheddar cheese, cream cheese, garlic powder and Worcestershire sauce. Beat with an electric mixer on medium speed until almost smooth. Cover and chill the mixture for 30 minutes. Once chilled, shape into an uneven ball shape resembling an apple. Using your thumb, create an indentation in the top. Then, coat liberally with paprika until completely covered. Insert a twig into the indentation and serve with crackers. Trust me. Your friends will love this. Now, on to the sweets! 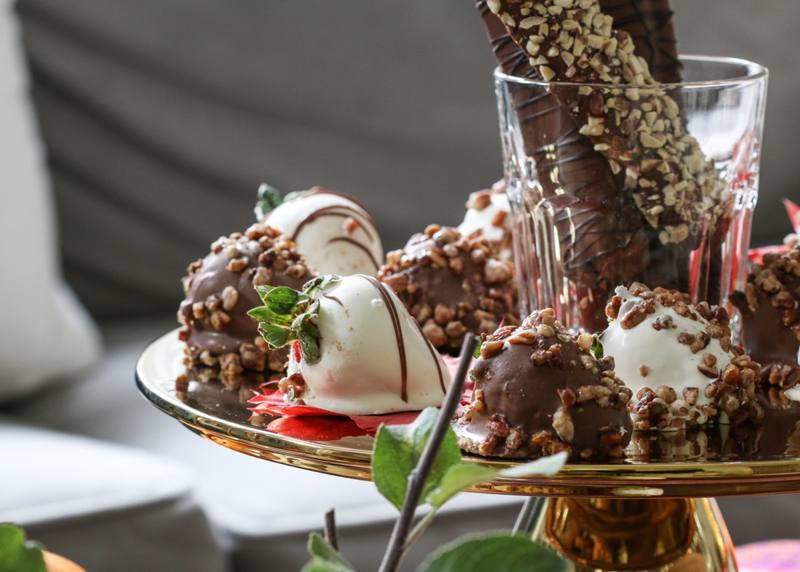 These Praline Pecan Strawberries are the centerpiece of my table, as they are a perfect flavor combination for the season. 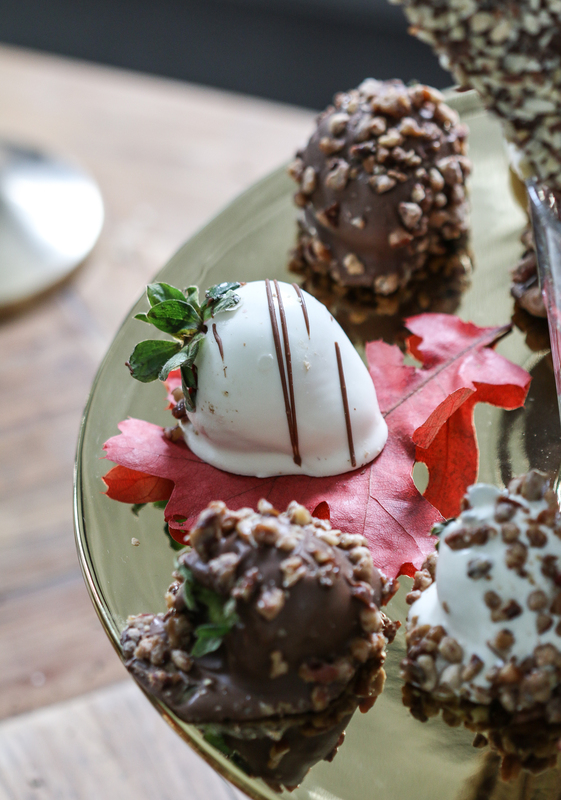 To continue with the pecan theme, I paired my strawberries with these Praline Pecan Cake Pops. Crème cake mixed with praline pecans creates the perfect bite-sized sweet. 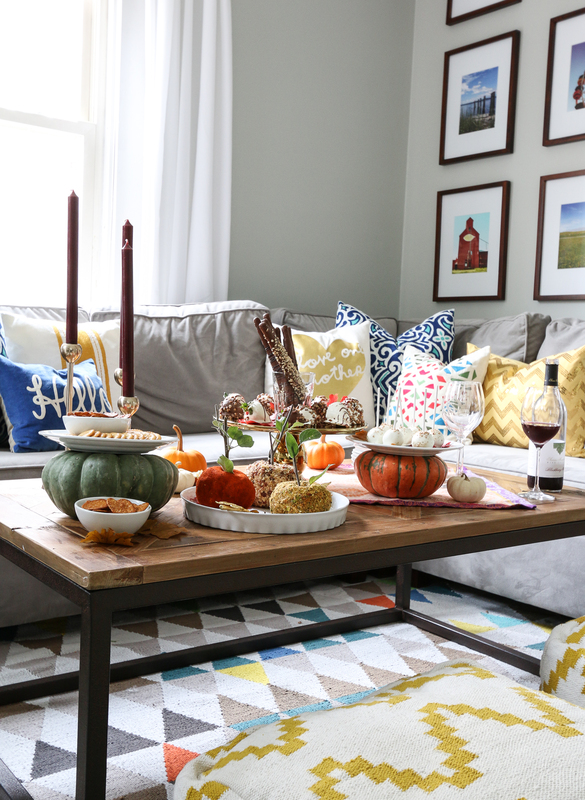 You’ll also notice that I used some pumpkins to give my coffee table buffet a little height and décor. 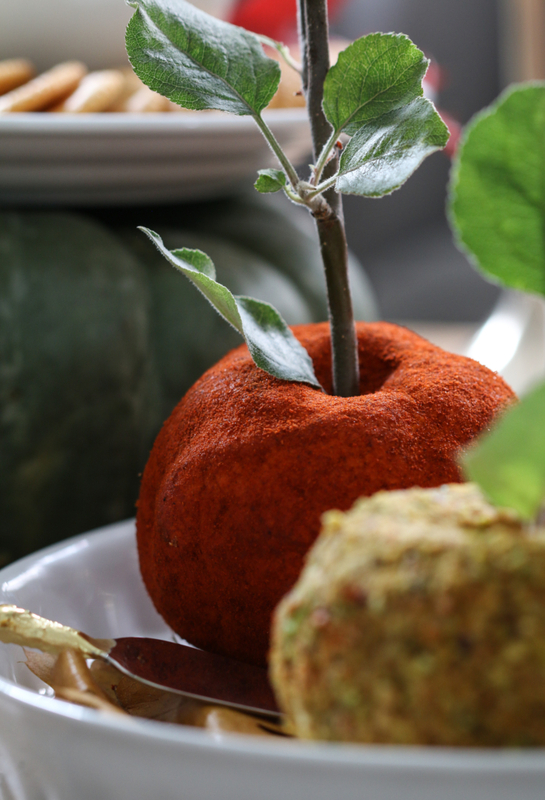 Simply set your plate of goodies on a pumpkin for unique, seasonal display. 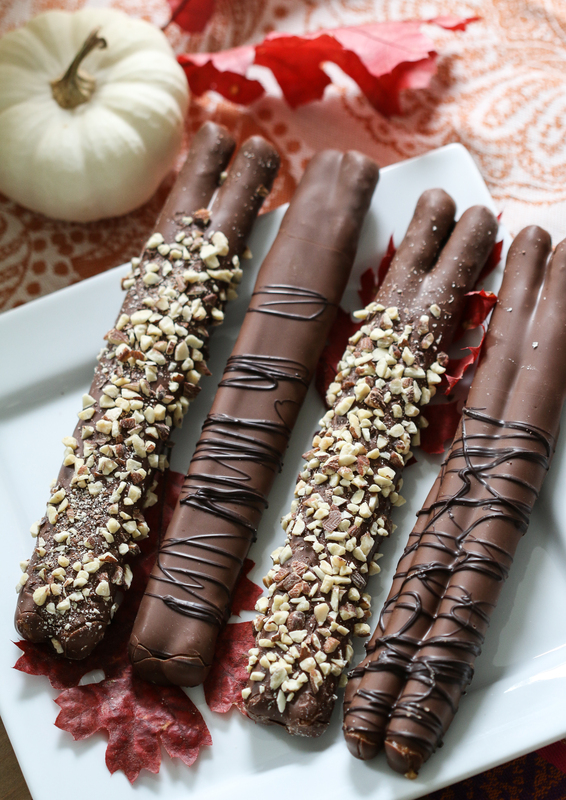 And finally, to wrap up this delightful dessert sampling, I’m serving a few Hand-Dipped Caramel Pretzel Twins. I thought these would also be a fun treat for my friends to take home—if there were any left. As you can see, having a Friendsgiving celebration is a great way to enjoy the company of others and snack on yummy holiday treats without the pressure of cooking a turkey and all the fixings. So call your friends, pick up some wine, order some sweet snacks and have a fabulous and memorable Friendsgiving!